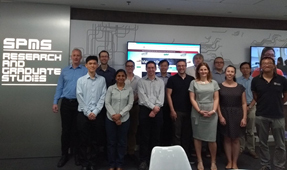 A group from the SoC together with colleagues from St Andrews, Glasgow and Strathclyde universities visited Singapore to exchange ideas and build new partnerships. During the successful and productive trip, we visited National University of Singapore (NUS), Nanyang Technological University (NTU) and the Agency for Science, Technology and Research (A*STAR). The SoC already has a long-running undergraduate exchange programme with NTU and plans for a similar arrangement with NUS. The University of Edinburgh has also recently signed an agreement with A*STAR to enable 1-2 year placements of Edinburgh PhD students in Singapore working on joint Edinburgh-A*STAR projects.